Resize online your animated gifs, photo's or pictures with an easy to use slider. Upload your image and make your image smaller online. 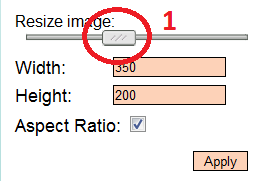 The resize toolbar will be shown, where you can resize your image by sliding the slider (1), or you can fill in the new width and height for your image(2). 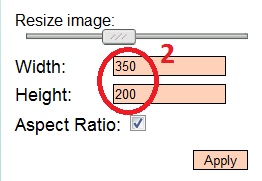 There is also an option "Aspect Ratio" (3). 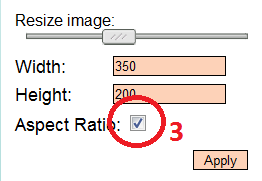 If this option is checked, the image will keep it's width and height proportion. With other words, if the width will get 2 times wider, the image will get 2 times higher. For most images this is rather important. If you change the width and height proportions, you might end with a blurred image. If (for some reason) you want to have different proportions, you might consider to crop the image , instead of resizing it. Or consider to convert the image to PNG format before resizing. As PNG resizes loss-less. Images in format JPG will create lossy images, while GIF images can only handle 256 (different) colours per image.